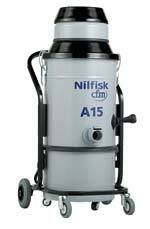 Nilfisk CFM's A15 pneumatic vacuum was developed to operate entirely without electricity while providing suction, filtration, and durability. To create suction, the vacuum uses air pressure generated by a compressor that is driven through a venture. The compact and maneuverable vacuum is well-suited for easy transport and use in confined spaces.